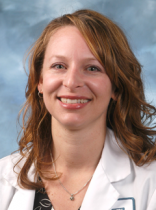 The UMKC Health Sciences District has announced the appointment of Alison Troutwine as project manager for the District. She will be working out of Truman Medical Centers. In this newly created role, Troutwine will work with District partners to define strategic objectives and complete action plans in line with those objectives. 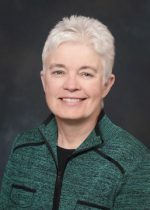 She previously served as executive administrator at UMKC School of Medicine and has worked on UMKC Health Sciences District initiatives since May 2017. She brings a background and familiarity with the District partners to her new position, where she will continue to help move the District forward strategically. 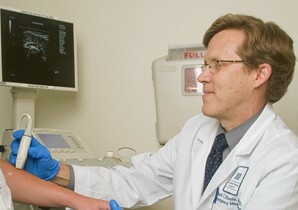 Prior to joining UMKC in 2014, Troutwine worked in the Department of Surgery at the University of Missouri-Columbia School of Medicine. She will complete her master’s degree in Nonprofit Management at the UMKC Henry W. Bloch School of Management in December 2018. 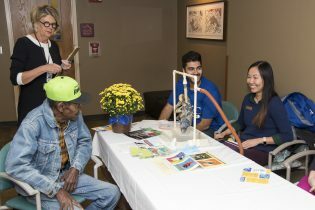 The UMKC Health Sciences District combines the unique expertise and services of 12 neighboring institutions to spur health-related research and community outreach in service of the Kansas City region and beyond. 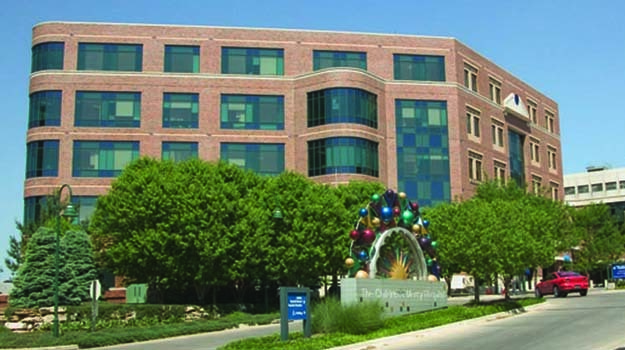 Partners include UMKC and its schools of dentistry, medicine, nursing and health studies, and pharmacy; Truman Medical Centers; Children’s Mercy; Kansas City, Missouri Health Department; Missouri Department of Mental Health Center for Behavioral Medicine; Jackson County Medical Examiner; Ronald McDonald House Charities of Kansas City; and Diastole Scholars’ Center. Banners started going up Monday along the perimeter of the UMKC Health Sciences District. 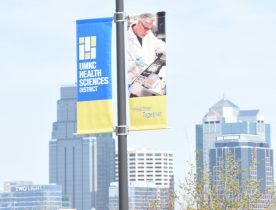 Monday was truly a banner day for the UMKC Health Sciences District as banners started going up on light poles ringing the area bounded by 22nd Street, Gillham Road, 25th Street and Troost. The colorful 5- by 6-foot canvas banners each have two halves, one showing the district logo and the other the district motto (Healthier Together) and a photograph depicting one of the district’s four emphases: clinical patient care, research, health sciences education, and community health and outreach. The banners are the latest effort to raise the profile of the district, which started in May 2017 and brings together UMKC and its Schools of Dentistry, Medicine, Nursing and Health Studies, and Pharmacy; Truman Medical Centers; Children’s Mercy; the Kansas City, Missouri, Health Department; the Missouri Department of Mental Health Center for Behavioral Medicine; the Jackson County Medical Examiner; Diastole Scholars’ Center; and the Ronald McDonald House Charities of Kansas City. The district earlier this year announced that it is becoming the presenting sponsor for the Hospital Hill Run, to be held June 1 and 2 this year. For the past several years, the School of Medicine has sponsored the Friday evening 5K race that kicks off the weekend. 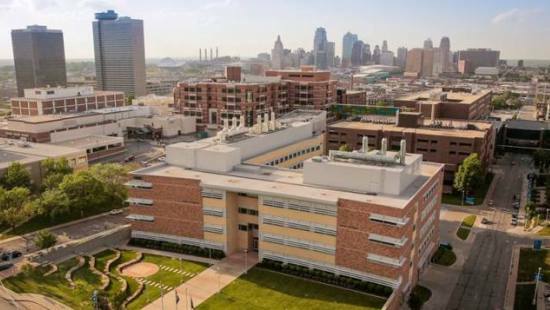 The UMKC Health Sciences District is unlike any other in the nation. It is one of 18 areas in the country that have public schools of medicine, pharmacy, dentistry and nursing in one location along with a children’s hospital and an adult, acute-care hospital. 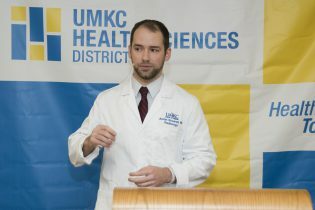 By including a health department, the medical examiner and a mental health center that bring together agencies of the city, county and state, the UMKC Health Sciences District is one of a kind. Zei Uwadia, center, is shown with her mother and Children’s Mercy Hospital medical team. Clockwise from left: Kari Davidson, Jenna Miller, M.D., Ryanne Toland, Julie Pearson, Debbie Newton, Jay Rilinger, M.D., Jill Dinkel, Marita Thompson, M.D., and Zei’s mother, Brie Kerschen. Sixteen-year-old Zei Uwadia was a healthy teenager before she was admitted to the hospital suffering from shortness of breath on October 29. Her lungs quickly declined and stopped functioning without any explanation, and her condition remains a medical mystery to this day. 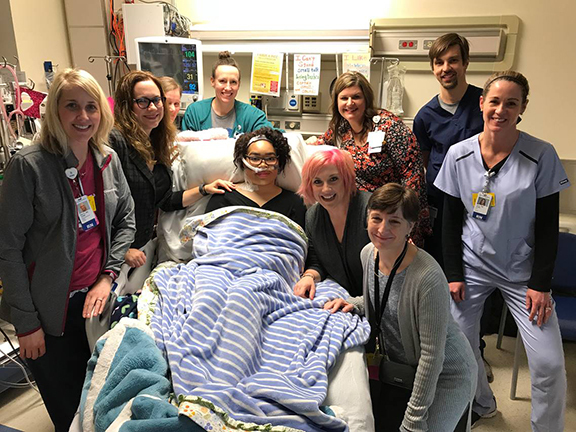 On Nov. 6, Zei was placed on an Extracorporeal Membrane Oxygenation (ECMO) machine at Children’s Mercy Hospital Kansas City to keep her alive. Basically, the machine acts as her lungs to deliver oxygen to her blood. Since being put on ECMO, she continues to amaze the staff. Zei is the first person in the 30 year history of ECMO at Children’s Mercy to sit up while on the machine. She’s also the first person to stand, the first person to eat, the first person to peddle a stationary bike and the first person to walk. Zei’s story has been featured on CNN. Zei was in her hospital bed for two months before ever taking her first step. When she approached her care team about walking, they weren’t even sure how to make this happen. No one had ever walked while on ECMO at Children’s Mercy. It’s a large machine that is meant to be stationary. The ECMO program director told Zei if she could stand for five minutes they’d figure out how she could walk. Zei not only stood for five minutes, but when the five minutes was up she stood for another two minutes to prove to everyone she was strong enough and ready. Her doctors and nurses quickly came together to develop a safety protocol/comprehensive checklist to make it possible for Zei (and patients like Zei) to walk the halls of the hospital with the machine. Zei has been walking since December 29 and she continues to walk on a regular basis when she’s feeling good. 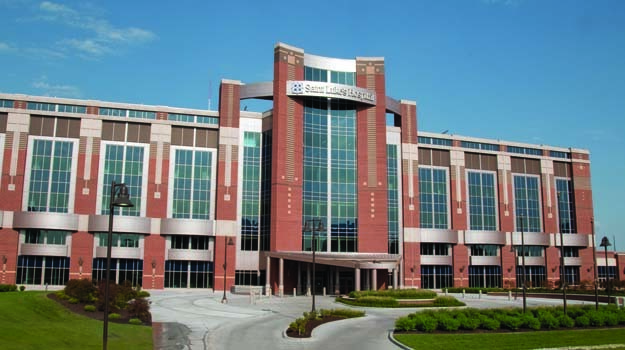 Several pediatric hospitals have reached out to Children’s Mercy after learning about Zei. They’re interested in developing their own safety checklists in hopes their ECMO patients can someday walk too. Mark T. Steele, M.D. ’80. The addition of a second antibiotic to treat cellulitis skin infections did not result in significantly better cure rates in research recently published in JAMA, the Journal of the American Medical Association. The study was the latest from an emergency medicine research group that includes Truman Medical Centers and Mark T. Steele, M.D. ’80. 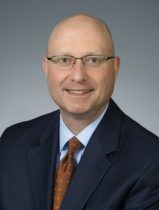 Steele is associate dean for TMC Programs at the UMKC School of Medicine and chief medical officer and chief operating officer for Truman Medical Centers. The study involved 500 patients who had cellulitis that was not accompanied by abscess or a wound. Half of those patients were treated with cephalexin, an antibiotic effective against streptococci that typically is used in such cases. The other half got cephalexin plus trimethoprim-sulfamethoxazole, an anti-staph antibiotic that more patients with skin and soft-tissue infections have been receiving “just in case” MRSA — methicillin resistant Staphylococcus aureus — is present. For the entire group treated, the added antibiotic seemed to help, producing a cure rate of 76.2 percent, versus a 69 percent cure rate for those who received just cephalexin. But that difference was not considered statistically significant. In addition, when the results were narrowed to the patients who were known to have taken at least 75 percent of the recommended doses of their antibiotics, the cure rates were almost identical, 83.5 percent for those who also got the second antibiotic, and 85.5 percent those who received just cephalexin. MRSA has been showing up as a cause of more severe, abscessed skin infections, which has led to more dual prescribing of the antibiotics. Steele said this study’s results could inform emergency physicians that for cellulitis, absent abscess or a wound, the addition of the second antibiotic wasn’t more effective. Amy Stubbs, M.D., helped oversee Truman’s portion of the research. She’s an assistant professor of emergency medicine at the School of Medicine and director of the school’s emergency medicine residency program. 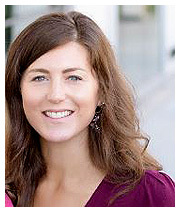 She completed her residency in emergency medicine at UMKC and was chief resident. The National Institutes of Health sponsored the study, which Steele said was particularly well constructed to meet the standards of JAMA, the world’s most widely circulated medical journal. It was the third in a series of published studies by the emergency research group, called the EMERGEncy ID NET. One dealt with treatment of abscesses and was published in the New England Journal of Medicine. Another looked at infected wounds seen by emergency physicians and was published in the journal Clinical Infectious Diseases. Michael Artman, M.D., seated on the left, and Tom Curran, Ph.D., FRS, seated on the right, were honored as Eminent Scholars by Children’s Mercy Hospital. Two UMKC School of Medicine faculty members have been honored by Children’s Mercy Hospital as its first Eminent Scholars, academic medicine’s highest honor. Michael Artman, M.D., chair of pediatrics, was named the Joyce C. Hall Eminent Scholar in Pediatrics. Tom Curran, Ph.D., FRS, professor of pediatrics, chief scientific officer and executive director of the Children’s Research Institute, has been named the Donald J. Hall Eminent Scholar in Pediatric Research. Eminent scholars are endowed positions given only to medical specialists and researchers recognized internationally for contributions to improving effective treatments and lifesaving cures. Artman joined the School of Medicine faculty and Children’s Mercy in 2010 as chairman of pediatrics and Joyce C. Hall Distinguished Professor of Pediatrics. A pediatric cardiologist with an interest in heart failure, his research has focused on excitation-contraction coupling and regulation of contractile function in the immature heart. Curran came to Children’s Mercy and UMKC School of Medicine earlier this year. He has been recognized for many research breakthroughs, including recent efforts studying pediatric brain tumors. His work spans molecular biology, neurobiology and cancer research, and he has published nearly 300 articles, which have been cited more than 50,000 times. Hallmark Cards founder “J.C.” Hall and his son and current chairman Donald Hall endowed the positions. 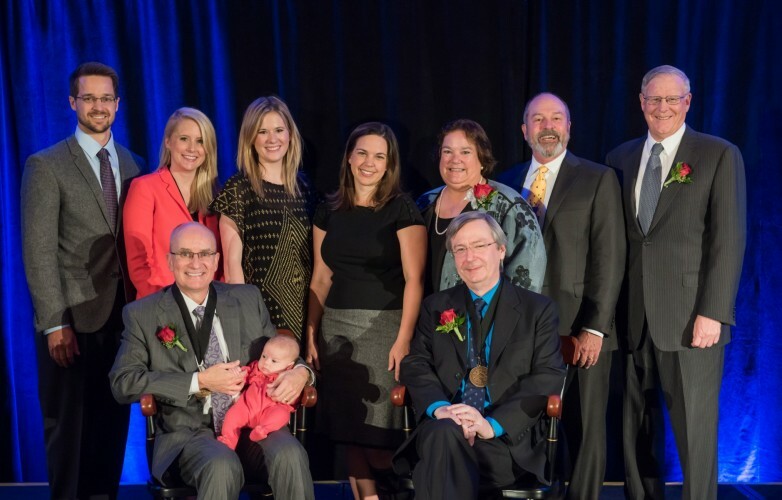 Children’s Mercy honored Artman and Curran on Nov. 14.